Olfaction or olfactory perception is the sense of smell. This sense is mediated by specialized sensory cells of the nasal cavity of vertebrates, which can be considered analogous to sensory cells of the antennae of invertebrates. 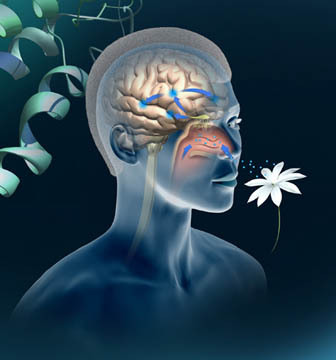 In humans, olfaction occurs when odorant molecules bind to specific sites on the olfactory receptors. These receptors are used to detect the presence of smell. They come together at the glomerulus, a structure which transmits signals to the olfactory bulb (a brain structure directly above the nasal cavity and below the frontal lobe). Many vertebrates, including most mammals and reptiles, have two distinct olfactory systems - the main olfactory system, and the accessory olfactory system (used mainly to detect pheromones). At the top of your nasal passages behind your nose, there is a patch of special neurons about the size of a postage stamp. These neurons are unique in that they are out in the open where they can come into contact with the air. They have hair-like projections called cilia that increase their surface area. An odor molecule binds to these cilia to trigger the neuron and cause you to perceive a smell. Each of the hundreds of receptors are encoded by a specific gene. If your DNA is missing a gene or if the gene is damaged, it can cause you to be unable to detect a certain smell. For example, some people have no sense for the smell of camphor. When you smell many fruits or flowers, what you are smelling is esters evaporating from the fruit or flower. Esters are organic molecules. For example, the ester that gives a banana its smell is called isoamyl acetate, and the formula for it is CH3COOC5H11. The primary smell of an orange comes from octyl acetate, or CH3COOC8H17. Esters can now be made artificially, and that is where artificial flavors come from. The thousands of aromas humans can smell can be sorted into 10 basic categories, US scientists say. Prof Jason Castro, of Bates College, and Prof Chakra Chennubhotla, of the University of Pittsburgh, used a computerized technique to whittle down smells to their most basic essence. They tested 144 of these and found they could be grouped into 10 categories. The findings are contentious - some say there are thousands of permutations. It would be important to start testing the theory on more complex aromas, such as perfumes and everyday smells. In reality, any natural scent was likely to be a complex mix - a blend of the 10 different categories, he said. 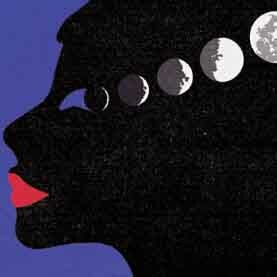 A woman's mood and appetite are clearly tied to her menstrual cycle, but other, more subtle changes in thinking and behavior also occur. In particular, her sense of smell sharpens as fertility peaks in the latter half of her cycle. A study published in Hormones and Behavior compared the smell sensitivity of 16 women taking oral contraceptives and 17 naturally cycling women during two different phases of the menstrual cycle - around the time of ovulation and during the luteal phase, immediately after ovulation. Participants sniffed odors of lemon, peppermint, rose, musk and the male pheromones and androsterone. Naturally cycling women near ovulation were more sensitive to musk and the pheromones than the women on contraceptives. 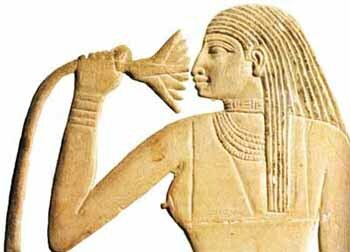 The effect may not be limited to male scents: a study in March in Physiology and Behavior suggests that women have a sharpened sense of smell in general during their luteal phase, as measured by their ability to detect the subtle odor of the alcohol n-butanol. These results are typical of research in this area; effect sizes are small, and not all studies agree on the details. Even so, the findings support a popular hypothesis that hormone levels in a woman's body influence her senses and preferences in a way that promotes reproduction. Smell provides one of the best markers of who you really are. The reason for this is that your smell is determined by the same set of genes, the major histocompatibility complex genes (MHC), as your immune system. It is part of who you are, your personal chemical signature. The MHC gene complex is particularly susceptible to mutation, producing new immune complexes with each new generation. This is probably just as well, as these are our first line of defense against bacteria and viruses which are themselves undergoing constant genetic change. Our immune-system genes have evolved to be almost as changeable as virus genes in an effort to track the ever-changing biological threats that we face from them. So smell may be one way of checking out who's a good bet and who's not, but it's not the only function of smell in this context. Female moths famously dribble molecules of an incredibly powerful scent into the air. Male moths can detect these scents in the tiniest quantities from hundreds of yards away and find them quite irresistible. These sexual attraction scents are known as pheromones and occur widely in the animal kingdom, including monkeys. There has been some debate as to whether or not they occur in humans, but, in fact, there is considerable evidence to suggest that they do.